Been a little while since I’ve written about my lil’ ol’ series. 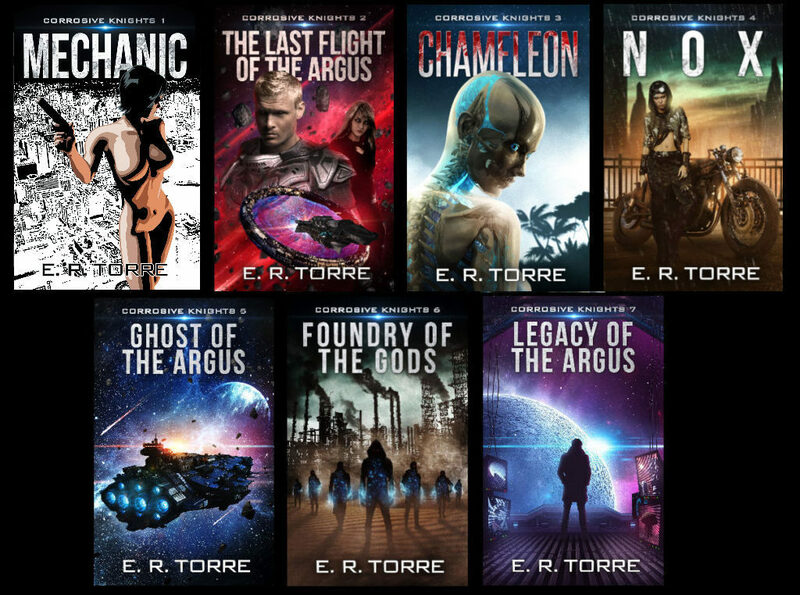 First, its been a very good couple of months since the release of Legacy of the Argus, the seventh and concluding chapter in the Corrosive Knights series. I’ve seen a big increase in people both reading the books (almost all of them are available to be read “free” if you have Kindle Unlimited) and purchasing them (to then, very hopefully, read as well!). I’m also incredibly honored to find the increase in positive reviews of the books in Goodreads.com as well. Please, keep it up and bring on more reviews in Amazon.com as well! In the time since releasing that book, I’ve also been writing a new book set in the Corrosive Knights “universe”, though I have to admit I’m still kicking ideas around and I’m not entirely certain how things will shake up in the end. Originally, I was intending to release an 8th Corrosive Knights novel which would serve as an “Epilogue” to the CK series. However, since releasing Legacy of the Argus and after giving it some thought, I decided to put that book on hold for now. The reason being is that the story, which is already pretty much done though it is much shorter than any of the books in the series, serves as a good conclusion to the series and I find I’m not willing to end it all quite yet. I feel I’ve set a very high bar for myself with the CK series. Without sounding incredibly obnoxious, I feel the series is pretty damn great as is and if I’m going to add to it with “new” novels, they better damn well not be lame add-ons but full-fledged great stories in their own right. So I started writing this new CK book shortly after the New Year and, I’m not going to lie: It has been a bit of a struggle to figure out where I want to go here. I spent a few weeks working on one particular set of story ideas but found my mind moving in other directions and effectively re-started later in the month with another concept. I’ll keep working at this. I’m nothing if not bullheaded and will eventually crack this nut, but in the meantime, THANK YOU GUYS SO MUCH for giving my books a try and for the positive reviews you’ve given. I truly, truly appreciate it!